I appreciate your interest in my baskets and hope that this look at my work will be informative. I make splint baskets in a wide selection of styles, sizes and finishes, from natural wood to aged paint in many colors. Don't hesitate to contact me with any questions you may have. Basketry is possibly the oldest of crafts. For thousands of years, baskets served as indispensable objects in every culture. Though modern society is less dependent on them, our long connection seems to have left an archetypal imprint, a symbol of elemental simplicity. Their inclusion in our homes can soften the edges of our often hectic daily lives. My first exposure to splint baskets was through the work of the Shaker and Taghkanic basketmakers whose communities were near my home in the upper Hudson Valley of New York State. I pursued the craft, inspired by the idea of making beautiful rugged baskets from native trees with a few simple hand tools. 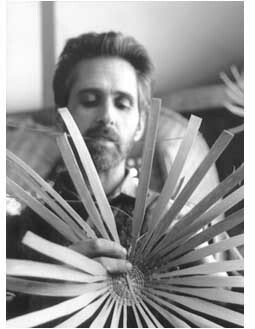 In 1980, I had the opportunity to work with Newt Washburn, a 4th generation, New Hampshire basketmaker, and from him. I learned many basics of the craft.